"Practice that feels like play." That's one of the goals of IXL, an online math and reading practice program Adam (13), Kaden (11), and River (5) were given to use for review. Math: Play? Seriously, we're doing Algebra around here and there's nothing playful about that. Pre-Algebra - also not much fun. There were two unconvinced boys in my home! First grade math, yeah, that is pretty fun ... at least River went into this one confident he'd like it. 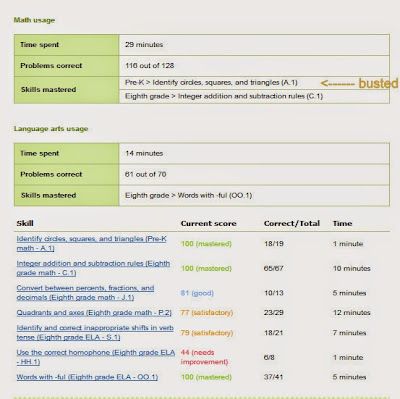 IXL (I had to hear it said out loud to understand the name) is an internet based Math and Language Arts program practice program. The math portion covers preschool through high school, the language arts program currently covers 2nd through 8th grades. The program is very easy for the students to use and operate and all the kids, even River, were able to use the program independently. 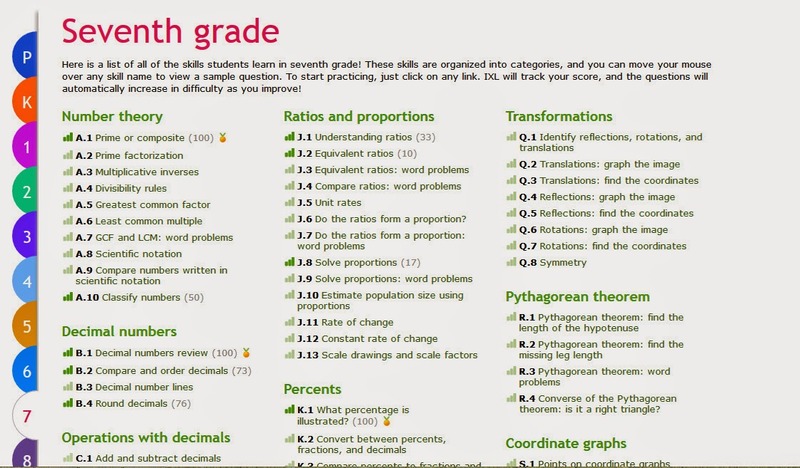 Within each grade are a vast array of topics and skills. For example, Kaden is working on 7th grade math. 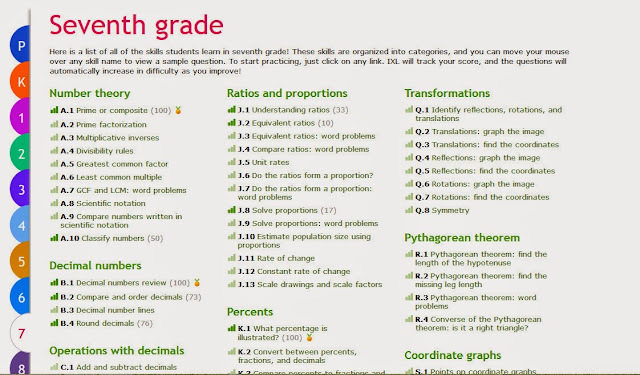 256 7th grade skills are covered, that's more than one skill per school day. When deciding what skill set to work on the student can hover over the skill and a sample question will pop up, perfect for River who couldn't read all the words in the skill set listings but could easily understand the sample questions. Clicking on a skill set will lead to questions about that specific skill. As the student answers each question correctly they earn points. 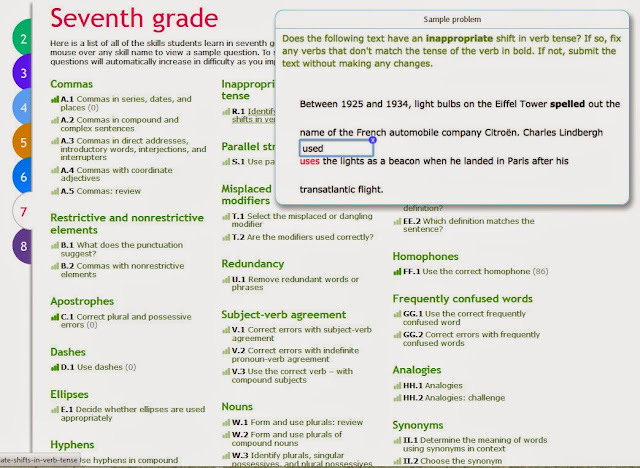 An incorrect answer results in the loss of points. 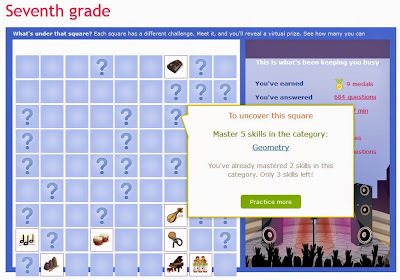 As the student progresses the questions will become more difficult and fewer points are awarded for each correct answer. After mastering a skill by earning 100 points those mastered skills earn medals and help the child earn rewards. The skill questions do not include lessons, this program is a review program and focuses on enhancing what the kids are already learning in their classes. There are explanations for wrong answers though, explaining what might have been done wrong and how to do it right, which is very helpful when the child doesn't know where his misunderstanding is. I worked on one of Kaden's skills, Prime or Composite Numbers. While the skill itself wasn't super difficult I found the occasional wrong answers set me way back and made me work really hard to get to 100. Plus there was a timer, so I felt I had to hurry. I did it, but it took over 10 minutes. I felt quite mentally challenged! Let me point out that I did, proudly, earn a gold medal (see below). As the student reaches 100 points and earns medals they receive prize. 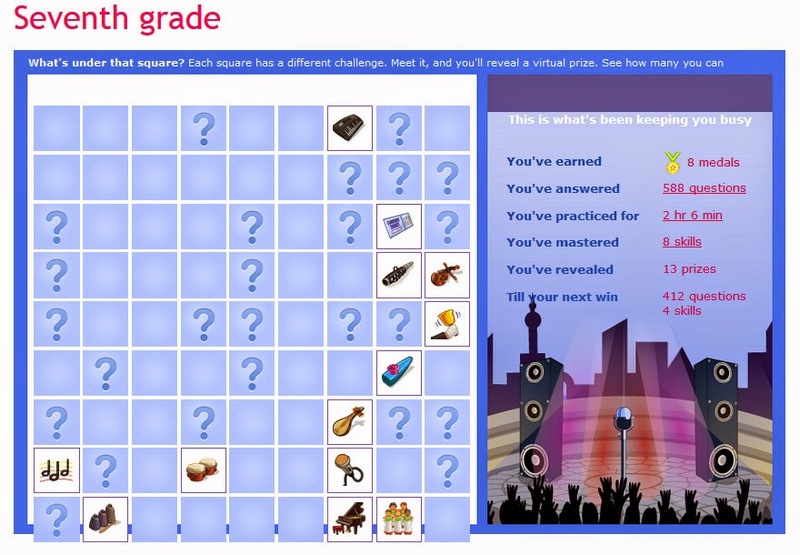 Prizes uncover tiles on a rewards board. This may seem super simple and not like the most motivating thing ever, but the kids raved about it. Even Mia, who used IXL last year (not for a review) talked excitedly about the tiles. IXL seems to know what works! While I incorporated 20 minutes of IXL per day into the kids school schedules I didn't supervise them as they worked, allowing them to explore the site and work independently. River had no problem using his 20 minutes in the First Grade area, where he felt comfortable, and tried a variety of different math activities. Adam and Kaden explored the site a little more, which is exactly what I wanted them to do, and, once or twice, while trying to meet their 20 minute time quota without doing any work, checked out the preschool section. Um, yeah ... not exactly what I wanted them to do. At the time they weren't aware that IXL sends out a weekly parent report telling me how long each child worked, what they worked on, and how they did ... it didn't take long for me to discover the preschool work they were doing (at least this one mastered the skill and did it quickly) and to encourage them to work on more age appropriate material. For the most part they did stay within their grade level and did their best. The weekly report was very helpful, letting me know what they were working on and how they were doing. All three boys work was combined on one weekly report, making it super easy to keep track of their work. Overall, I am very pleased with this program. 99% of the time the boys worked on what they were supposed to and the drills helped them to learn and retain information far more effectively than just their math lessons. They enjoyed the Language Arts lessons and did pretty well in that arena. IXL is not "fun" as in full of whistles, bells, and silly songs, but it's a great learning tool and the kids did like it, especially earning awards and succeeding. I really like how easy it is to find one's way around the program. Very clear and simple. If I could change anything it would be to be able to set limits for the children, to be able to block certain grades or sections to keep the kids working on what they needed to be working on instead of the easier lower grades. IPad and Android apps are also included in the program, but we have neither so I was not able to give those a try. I liked how you have goals and when you finish them there's an award. The website is easy to access and well organized. I liked that there were time limits and that I could work at my own pace. I'd like it more if it kept track of how you advanced in a subject. For example, if I do one subject and then do it again I'd like it to tell me how much better I did the second time. There's a list of awards. Each award has a goal. One of the goals might be to master 5 skills in a certain category. 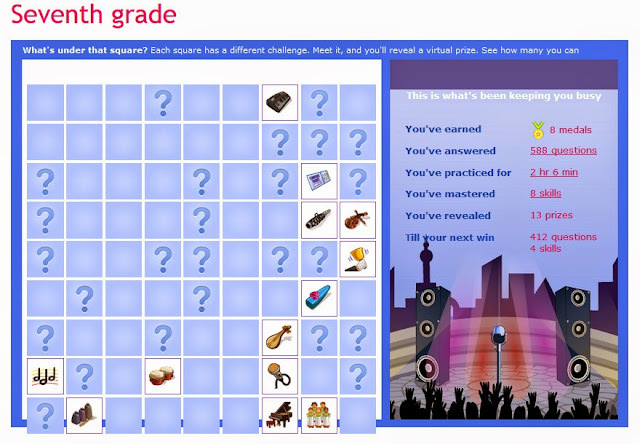 Once you complete the goal more question marks pop up with more goals. IXL is a fun learning website. It helps with Math and Language Arts. It is a challenge, not just easy, which I like. 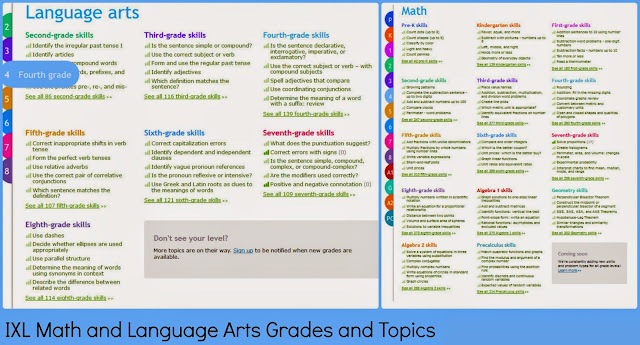 You can choose what grade you do and then what skills you want to practice. 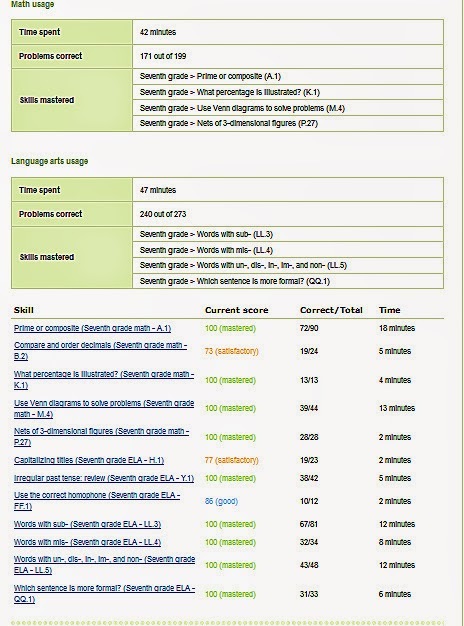 As you work you can check on what skills you've mastered and see where you need improvement. I like that the program tells you what you've done wrong and that you get rewarded for doing problems and mastering skills. I don't like that the Language Arts section doesn't give you points for the prizes. So, was it fun? Did it feel like play? Pretty much! I can't say the program has made all their math fun or that they'd admit math can be fun, but they did have fun playing games and using IXL. Reinforcing their lessons and skills does makes Math and Language Arts a whole lot less painful, if not fun. Moving forward I plan to target certain things for the boys to work on, mixing letting them work on whatever they want with working on specific skills. 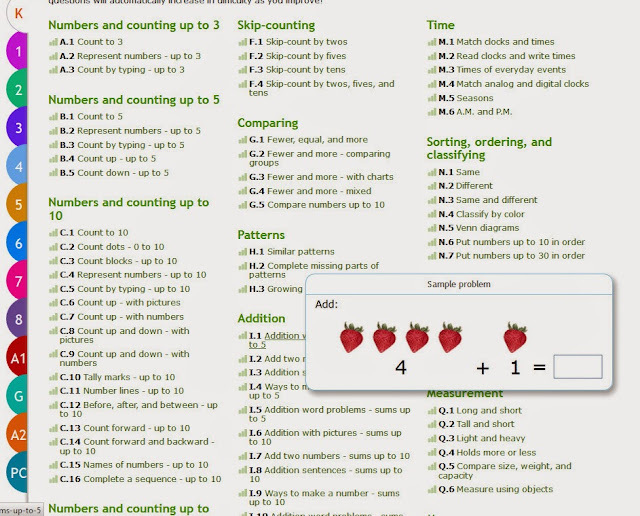 Mia suggested having a contest to see who can earn the most points in their age-appropriate levels, something that was done at her school last year with IXL, which I think we could have some fun with. 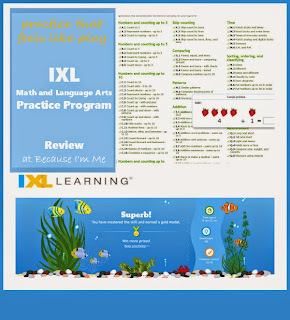 IXL Math is offered for students in Preschool through Algebra, Geometry, and Precalculus. 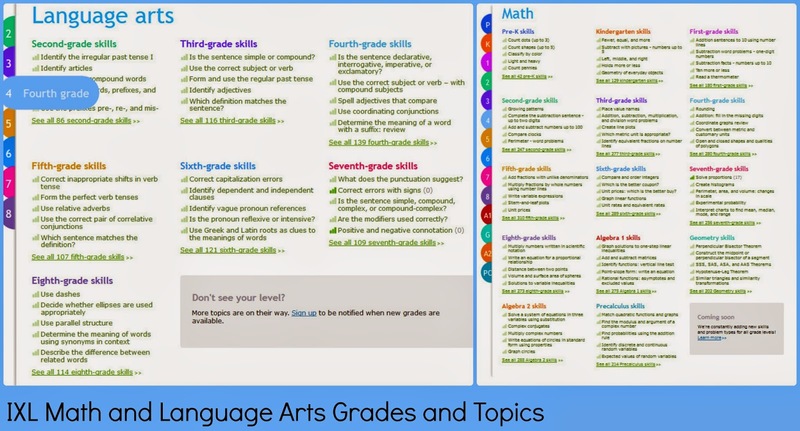 Language Arts is currently available for Grades 2 though 8, with plans to add more grades in the very near future. 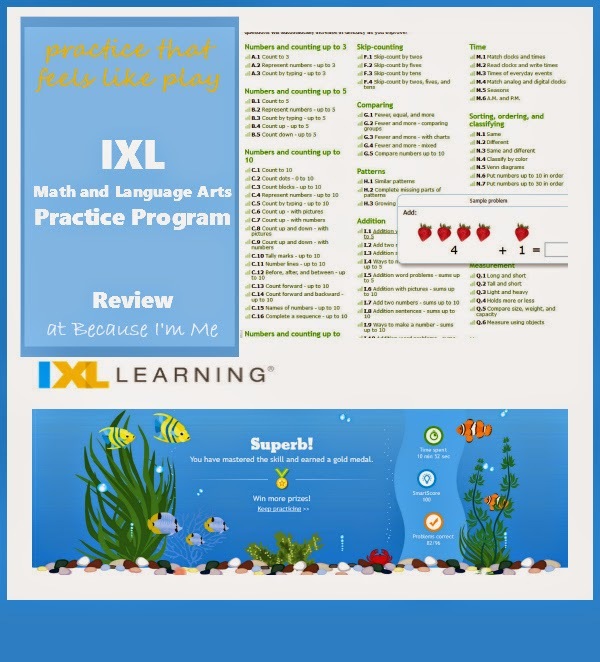 An annual IXL subscription for one child for math is $79; for math and Language Arts is $129; an annual IXL subscription for two children for math is $99; for math and Language Arts for two children is $149.